The polar bear attack on Phippsøya (Sjuøyane, Svalbard) from Saturday is discussed in media and social media worldwide. The Sysselmannen (governor, police) has released some details, but a lot of questions remain so far. At 08.30 a.m. (local time), a group of 12 staff members of the cruise vessel MS Bremen went ashore on Phippsøya to prepare a landing for passengers. 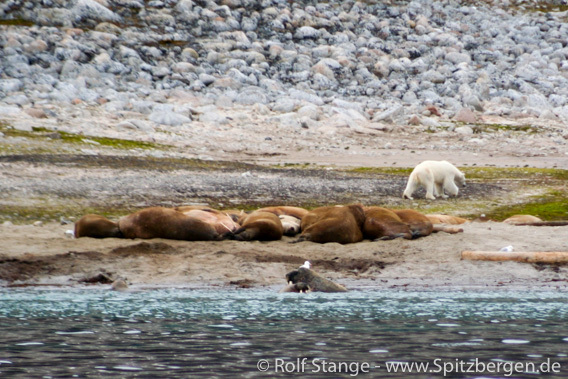 The group was attacked on land by a polar bear, which did not react to shouting and shooting with signal pistols. The bear attacked a 42 year old German staff member who suffered head injuries. The man was taken to the hospital and later Tromsø, his condition is stable. The bear was shot by 2 other members of the group and later flown to Longyearbyen by helicopter for investigations. This is the information which has been released officially. All information which circulates in current public discussions beyond this is speculative.